مهدیخانی, حسن, جلالی ترشیزی, حسین, جعفری پطرودی, سیدرحمان, میرشکرائی, سیداحمد. (1395). تولید کربوکسی متیل سلولز (CMC) از خمیرکاغذهای رنگبری شده باگاس و جوهرزدائی شده کاغذهای باطله مخلوط اداری: شناسائی و مقایسه ویژگی ها. مجله صنایع چوب و کاغذ ایران, 7(3), 311-321. حسن مهدیخانی; حسین جلالی ترشیزی; سیدرحمان جعفری پطرودی; سیداحمد میرشکرائی. "تولید کربوکسی متیل سلولز (CMC) از خمیرکاغذهای رنگبری شده باگاس و جوهرزدائی شده کاغذهای باطله مخلوط اداری: شناسائی و مقایسه ویژگی ها". مجله صنایع چوب و کاغذ ایران, 7, 3, 1395, 311-321. مهدیخانی, حسن, جلالی ترشیزی, حسین, جعفری پطرودی, سیدرحمان, میرشکرائی, سیداحمد. (1395). 'تولید کربوکسی متیل سلولز (CMC) از خمیرکاغذهای رنگبری شده باگاس و جوهرزدائی شده کاغذهای باطله مخلوط اداری: شناسائی و مقایسه ویژگی ها', مجله صنایع چوب و کاغذ ایران, 7(3), pp. 311-321. مهدیخانی, حسن, جلالی ترشیزی, حسین, جعفری پطرودی, سیدرحمان, میرشکرائی, سیداحمد. تولید کربوکسی متیل سلولز (CMC) از خمیرکاغذهای رنگبری شده باگاس و جوهرزدائی شده کاغذهای باطله مخلوط اداری: شناسائی و مقایسه ویژگی ها. مجله صنایع چوب و کاغذ ایران, 1395; 7(3): 311-321. خمیر رنگبری‌شده سودای باگاس به‌عنوان الیاف غیرچوبی و خمیر جوهرزدائی‌شده کاغذهای باطله مخلوط اداری (DIP) به‌عنوان الیاف بازیافتی، در محیط قلیایی و با استفاده از مونوکلرو استیک اسید (MCA) به‌عنوان عامل اتری‌ساز و تحت شرایط مشخصی؛ کربوکسی متیل‌دار شدند. ترکیب شیمیایی خمیرها مشتمل بر میزان آلفاسلولز، همی‌سلولز، لیگنین، مواد استخراجی و خاکستر، ظرفیت نگهداری آب، گرانروی ذاتی، میزان گروه‌های کربوکسیل و pH تعیین گردید. میزان آلفاسلولز به‌عنوان مهمترین ویژگی مشتق‌سازی در خمیر DIP %66/84 و در خمیر باگاس %33/71 و ترکیبات غیرپلی‌ساکاریدی (شامل لیگنین، مواد استخراجی و خاکستر) در خمیر DIP %92/5 و در خمیر باگاس %36/2 اندازه‌گیری شد. کربوکسی متیل‌دار کردن سلولز انجام و درجه جایگزینی (DS)، گرانروی، خلوص، pH و بازده CMC تولیدی نیز تعیین و وابسته به منشا خمیر سلولزی تشخیص داده‌شد. ویسکوزیته و خلوص CMC تولیدی از خمیر DIP (به ترتیب981 سانتی‌پوآز و 93%) بیشتر از CMC تولیدی از خمیر باگاس (به ترتیب680 سانتی‌پوآز و %33/87) اندازه‌گیری شد که به میزان بالاتر آلفاسلولز آن نسبت داده‌شد. در حالیکه بازده و DS در CMC تولیدی از خمیر باگاس (به ترتیب %8/168 و 57/0) در مقایسه با CMC تولیدی از خمیر DIP (به ترتیب %155و 45/0) بالاتر ارزیابی گردید، که از درجه کریستالیته و جرم مولکولی پائین‌تر ترکیبات باگاس نشات می‌گیرد و منجر به ورود و جایگزین‌شدن بیشتر گروه‌های کربوکسیلی می‌گردد. در مجموع، منابع خمیرهای سلولزی بومی می‌توانند به‌عنوان گزینه‌های ممکن و در دسترس برای تولید مشتقات سلولزی مدنظر قرارگرفته و منجر به حل مشکلات ناشی از کمبود منابع الیاف گردد. Appaw, C., 2004. Rheology and Microstructure of Cellulose Acetate in Mixed Solvent Systems, North Carolina State University in Partial Fulfillment of The Requirements for the Degree of Doctor of Philosophy, 14-16 P.
 Kamide, K. and Saito, M., 1984. Effect of Total Degree of Substitution on Molecular Parameters of Cellulose Acetate. European Polymer Journal, 20(9): 903-914. Faezipour, M., Khalafi, A., Mirshokraei, A., Lohrasebi, A. and Pirjani, A., 2005. Exploring the Possibility of Waste and Office Waste Paper Deinking Aquacel Method. 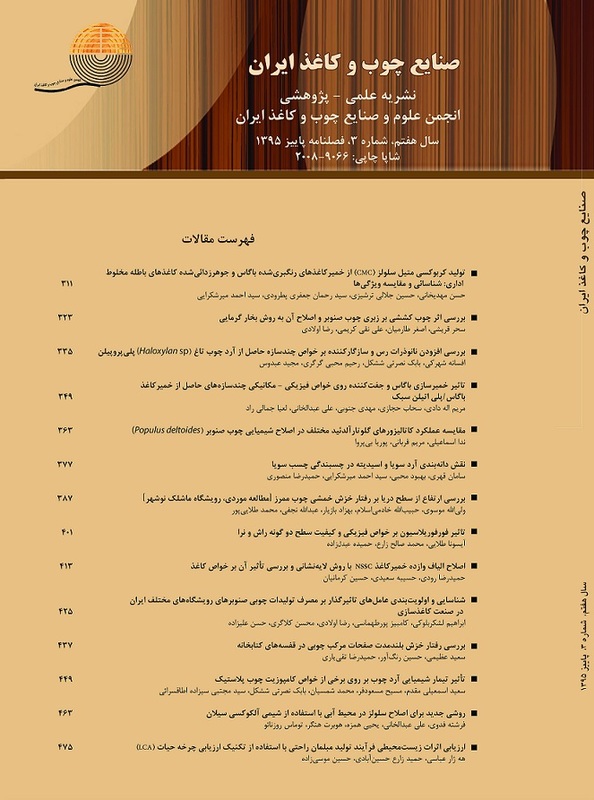 Iranian Journal of Natural Resources, 59(2): 467-457. (In Persian). Zohoorian Mehr, M.J., 2002. Carbohydrate Polymers, Journal of Chemistry, Vol. 16, No. 2, 21-29 P. (In Persian). Zohoorian Mehr, M.J., 2006, Cellulose and Cellulose Derivatives, Polymer Society of Iran, 38 P. (In Persian). Shostrom, A., 2006. Principles of Chemistry Wood, Seyed Ahmad Mirshokraei Translation, Academic Publishing Center, Tehran, 100-170 P. (In Persian). Mohanty A.K., Misra, M. and Hinrichsen G., 2000. Biofibres, Biodegradable Polymer and Composites: an Overview. J Macromolecular Materials and Engineering, 276: 277- 1–24 P.
 Bono, P.H., Ying, F.Y., Yan, C.L., Muei, R., Sarbatly, D. and Krishnaiah, M., 2009, Synthesis and Characterization of Carboxymethyl Cellulose from Palm Kernel Cake. Advances in Natural and Applied Sciences, 3(1): 5-11. Silva, D.A., De, R.C.M., Paula, P.A., Feitosa, A.C.F., De Brito. and J.S., Maciel, H.C.B., 2004. Carboxymethylation of Cashew Tree Exudates Polysaccharide. Carbohydrate Polymers, 58: 163-171. Toğrul, H. and Arslan, N., 2004. Carboxymethyl Cellulose from Sugar Beet Pulp Cellulose as a Hydrophilic Polymer in Coating of Mandarin. Journal of Food Engineering, 62: 271-279. Barba1, C., Montané, D., Rinaudo, M. and Farriol1, X., 2002. Synthesis and Characterization of (CMC) From Non-Wood Fibers I. Accessibility of Cellulose Fibers and CMC Synthesis. Cellulose 9: 319–326. Varshney, V.K., Gupta P.K., Naithani, S., Khullar, R., Bhatt, A. and Soni, P.L., 2006, Carboxymethylation of α-Cellulose Isolated from Lantana Camara with Respect to Degree of Substitution and Rheological Behavior. Carbohydrate Polymers, 63: 40–45. Mario, P., Adinugraha, D.w. and Marseno, H., 2005. Synthesis and Characterization of Sodium Carboxymethylcellulose from Cavendish Banana Pseudo Stem (Musa Cavendishii LAMBERT). Carbohydrate Polymers, 62: 164–169. Pushpamalar, VA., S.J. Langford, B., M. Ahmad, C., Lim, Y.Y., 2006. Optimization of Reaction Conditions for Preparing Carboxymethyl Cellulose from Sago Waste. Carbohydrate Polymers, 64: 312–318. American Society for Testing and Materials, Standard Test Methods for Carboxyl Content of Cellulose. ASTM D1926-00.2011. Browning, B.L.,1967. Methods of Wood Chemistry. Vol. II. Interscience, New York/London, Pp. 490–493 P.
 American Society for Testing and Materials, Standard Test methods for Sodium Carboxymethyl cellulose. ASTM D1439-03., 2008, E1 2003. Hong T. L., Borrmeister B., Dautzenberg, H., Phillip B., 1978. Zur Ermittlung des Sustituionsgrases losicher Carboxymethylccellulose durch Polyelektrolyttitration. Nc state university Zellst 2 (4): 207-210. Almlof, A. H., Schenzel, K. and Germgard, U., 2013. Carboxymethyl Produced at Different Mercerization Conditions and Characterized by NIR FT Raman Spectroscopy in Combination with Multivariate Analytical Methods. BioResources,8 (2): 1918-1932. Khullar, R., Varshney, S., Naithani, S., Heinze, T. and Soni1, P.L., 2005, Carboxymethylation of Cellulosic Material (Average Degree of Polymerization 2600) Isolated from Cotton (Gossypium) Linters with Respect to Degree of Substitution and Rheological Behavior. Journal of Applied Polymer Science, 96: 1477–1482. People’s Republic of China National Standards, Food Additive: Sodium Carboxymethyl cellulose. GB1904-2005. Wustenberg, T., 2014. Cellulose and Cellulose Derivatives in the Food Industry, Wiley, Berlin, Germany, 549 p.
 Zhang, G., Zhang, L., Deng, H. and Sun, P., 2010. Preparation and Characterization of Sodium Carboxymethyl Cellulose from Cotton Stalk Using microwave Heating. Journal Chem. Technol. Biotechnol, 86: 584–589. Hutomo, G., Marseno, D., Anggrahini, S. and Supriyanto, A., 2012. Synthesis and Characterization of Sodium Carboxymethylcellulose from Pod Husk of Cacao (Theobroma Cacao L.). African Journal of Food Science, 6(6): 180-185. Khaled, B. and Abdelbaki, B., 2012. Rheological and Electrokinetic Properties of Carboxymethyl Cellulose Water Dispersions In The Presence Of Salts. International Journal of Physical Sciences, 7(11):1790 – 1798.